Y’all, we had a BLAST with Echo Canyon River Expeditions. As a rookie, I was apprehensive about this trip. I thought I was getting in over my head. Pun fully intended. I was convinced I would spend the trip flying through the air and into the Arkansas River. Aaron had gone before, so he tried to reassure me. But he’s taller, stronger and generally less inhibited than me, so… I didn’t believe him! We chose an advanced group tour through the Royal Gorge in Canon City, which boasts lots of paddling, fast waters and level IV rapids! Aaron and I went with four friends; with our guide, that brought our boat total to seven. 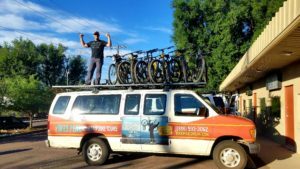 We arrived in Canon City in the morning to check in, sign waivers, and get fitted for helmets and life jackets. They also have wetsuits, if you want. We went in early July, and the water and weather were warm. Our guide said that the 4th of July time-frame is typically when the water gets warm enough to go without a wetsuit. We were advised to wear moisture-wicking fabrics that would dry easily like swimsuits or exercise apparel. I’m a wimp in cold water, but I was never cold. In fact, we were never wet for very long with the sun shining. Please remember your sunscreen! Faces, necks, ears, and, if you’re wearing shorts, the tops of your legs will need it! I’ll also remind you to bring dry clothes, towels, sunglasses, snacks and water. You may want a snack while you’re waiting for your group to head out. For a half-day tour, we were on the water for a few hours, plus we arrived an hour early. That left a lot of time to get hungry. The Royal Gorge location has a restaurant, but if you want something before you go, order early–they’re busy! You can take water bottles on the boat with you. Around noon, we (and about 30-35 others) boarded a bus to go to our starting location. We got a brief safety run down, as well as general instructions on how to paddle and what to expect on the river. We got off the bus, were assigned a guide, and got ready to go. Our guides checked our life jackets one last time, did their own versions of the safety instructions and reminded us of the basic commands they use. Our guide was Berto, and guys, request him! He was funny, had a lot of little facts about the area and the river, and he was very laid back, so for a first-timer he was great. We never tipped over, or flew out of the boat. I don’t think they can guarantee that every time; the river changes, weather changes and things happen, but no one in our entire group of 5-6 boats-full had a bad time. I know for certain that all 6 from my boat are eager to go again. It was fun going over some rapids and trying something new, and the Royal Gorge was amazing to see from the river. We were bussed back to our starting location, and had some lunch at the restaurant. They have photographers lining the shores as you paddle by (and a GoPro on the front of the boat), and you can purchase photos after the trip. Leave your phone in the car. You won’t have service, so unless it’s super waterproof, just leave it. The check-in desk will keep your keys, so you don’t have to take those either. Just an FYI, the guides do accept tips (though it’s not required), so you may want to bring some cash. All in all, we had a great time. 10/10! Echo Canyon offers tours for all levels of difficulty and all age ranges (starting at 4-5 years old). 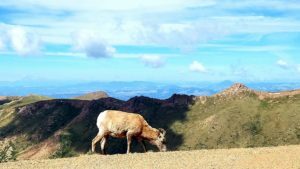 They have tours in Canon City through the Royal Gorge and in several mountain areas around Colorado including Vail, Breckenridge, Buena Vista and more. For more information, you can find them online. You can book your tour on their website, or give them a call to ask questions and find the right trip for you. 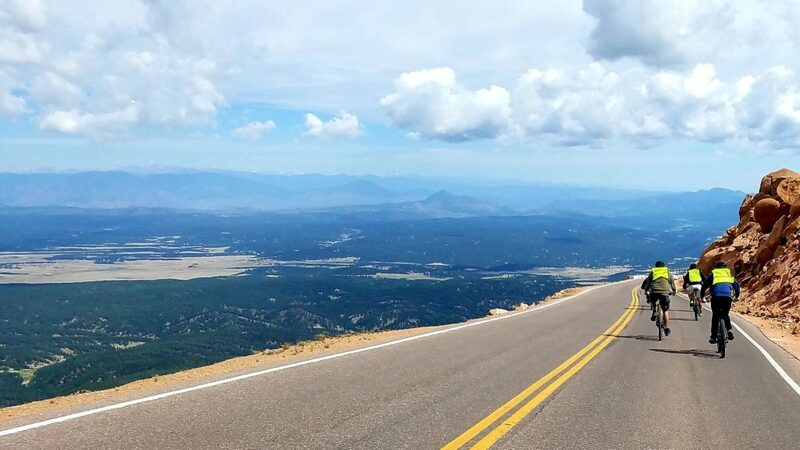 Get ready for a thrilling downhill ride with Pikes Peak Bike Tours. 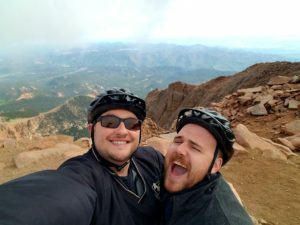 The best way to experience Pikes Peak is on a bike! I’ve been to the top several times, but this was my first time coming down on two wheels instead of four. Our guide Dan is ready to roll. The day starts at the shop where everyone checks-in and grabs breakfast. From there we’re given a demonstration about the bikes, and pile into the vans for our ride up to the Peak. The guides were fun and full of energy. Here’s my group leader Tyler. 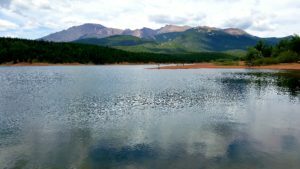 Pikes Peak Bike Tours has truly great guides to lead you on this adventure. Our guides, Wes, Tyler, Dan, Calie, and Austin, were very personable, and spoke to everyone as if we were long-time friends. Wes and Tyler lead my group, and as we drove, they kept the conversation going with fun tidbits about Pikes Peak and the surrounding area. They discussed what we could expect from the weather and also what to expect on the trip back down. At the top, we spent 15-20 minutes to visit the gift shop and take in the view. I wish we had a few more minutes to take photos at the top, but I was excited for the ride to begin. My friend Daniel and I were ready! It’s very cold up on the Peak year round, so make sure you bring a sweater and a windbreaker. PPBT has loaner gloves and some spare clothes, but it’s best to come prepared. Sunglasses and sunscreen are always good things to wear for any activity in Colorado. Soon the bikes were unloaded, and we were given a few minutes to ride around to gain our mountain legs for the trip to the bottom. We had one more safety/instructional huddle, then we were split into two groups, fast and slow. You pick your group based on your comfort level. The slow group allows people to travel back down at their own pace. Our fast group guide, Tyler, explained we would be traveling at speeds around 25 miles per hour most of the way down. The views really are second to none. Tyler led the group the whole way down; Wes followed in the van. The slow group was sandwiched between the other two vans for the trip down. Anytime cars needed to pass, we pulled off to the side of the road. I never felt nervous about the cars because our guides were so at ease and handled the whole group really well. We took a few stops along the way for photos and to let everyone catch up. If you wanted to switch the group you were in, you were allowed to switch at these stopping points. There are three short climbs on the trip. Our guides had no problem tossing a bike back up on the van to chauffeur reluctant participants uphill like a V.I.P. Once we made it to the bottom, everyone piled back in the vans, and they drove us to Old Colorado City for lunch. The meal and tip for the server are included in the ticket price, so you can walk in, sit down and eat without worry. After lunch, you return to the shop, where the trip ends. The group I ate lunch with decided to walk the few blocks back to the shop. The walk was a nice way to stretch my legs after being on the bike that long. I had such a great time, and no matter how many times I reach the summit, the view always takes my breath away. I have to give a HUGE thank you to the staff of Pikes Peak Bike Tours for an amazing trip. PPBT has even more ways to experience the area with tours along Gold Camp Road and even special event tours like their Fourth of July Fireworks Ride. I’ll definitely be coming back for another trip! Great, sunny weather makes rock climbing possible year round. Garden of the Gods is one of the best known attractions in Colorado Springs. Locals and out-of-towners alike flock to this iconic site to stretch their legs and also take some of the best pictures in town! 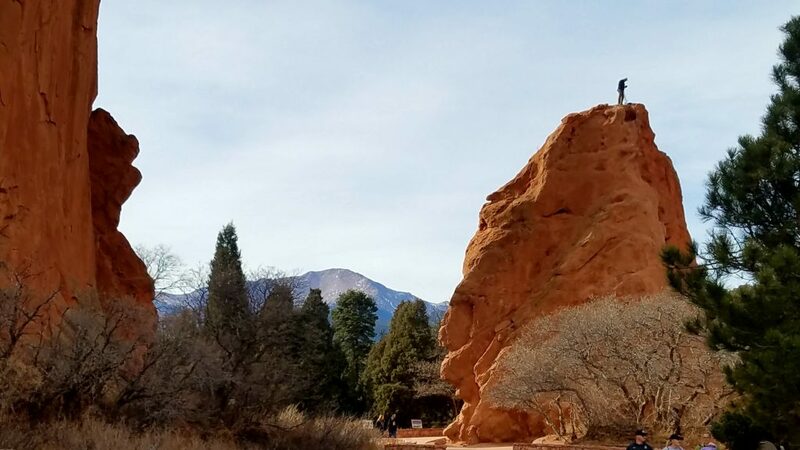 Whether you’re running, biking, walking the dog, out with the stroller, horseback riding or just looking to take a drive, Garden of the Gods is a must-see any time of year. The moderate climate keeps much of the winter blues (and the snow) at bay which has made this a year round destination for rock climbers as well. There are a few rules before you climb. First, you must fill out a climbing registration form to get your climbing permit with the city. It’s free to register, and you can do it online. Second, you must use proper Technical Climbing equipment and practices. You can review those on the City’s website here. 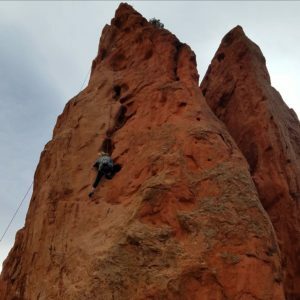 The City mentions some common-knowledge rules for climbing throughout Colorado Springs on the same page. 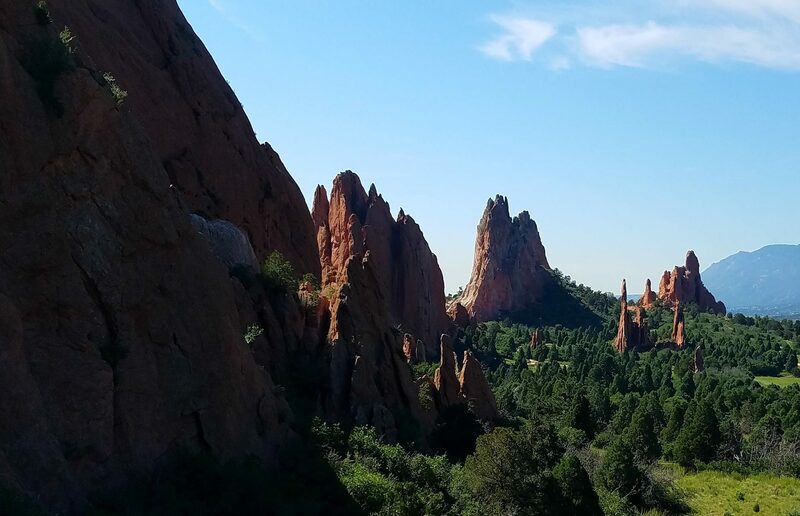 A guide is a great resource to use on your first trip skyward in Garden of the Gods. 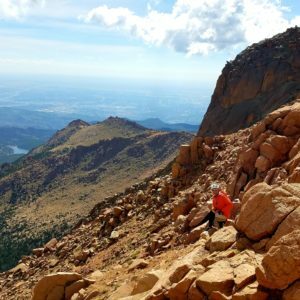 Front Range Rock Climbing Company offers half- or full-day tours which they cater to any skill level. They’ll provide the gear, the know-how, and even give you some great pictures to take home. 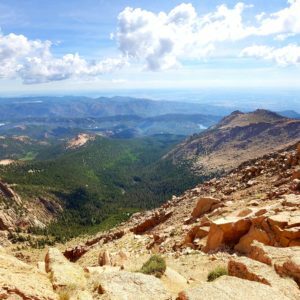 Book Your Trip to the Pikes Peak Region Now! If it is after hours, please feel free to call and leave a message. We will return your call as soon as we can. Listing No. 1395890 | Couple’s Retreat in Woodland Park Also book on Airbnb!